Over the last two decades, investors around the globe have suffered through several periods of volatility in financial markets. From the Asian Financial Crisis in 1997 and the internet bubble bursting in 2001, to the great recession beginning in 2008 and the European debt crisis in 2011, the global financial markets have not been this volatile since the end of the roaring 20’s going into the Great Depression. During this time period, rare colored diamonds have become one of the most important rare collectible as a means of preserving their wealth and owning and enjoying something of intrinsic value and inherent beauty that has stood the test of time for centuries. In the last decade, everything from classic cars to rare paintings, fine wines and of course rare diamonds have seen an increase in purchases from buyers around the world attracted to their beauty, rarity and value over the long-term. Forbes recently reported that luxury growth investments have grown by over 14% a year from 2008 to 2012, according to Wealth Insight’s 2020 Foresight Report. AIDC Advantage is pleased to offer you the chance to learn how rare colored diamonds can protect your wealth over the long-term and create a comfortable means of passing wealth on from one generation to the next during these unpredictable times. 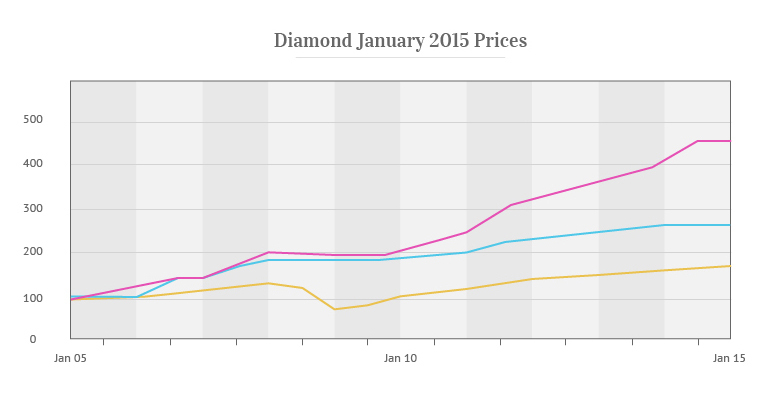 The index displays changes in average historic wholesale prices (per carat) of fancy color diamonds. Data points represent 1, 3, 5 and 10 cts in clarities ranging from IF-SI1. The data was collected semi-annually until July 2014 and will be updated quarterly moving forward. For specific information on subcategories, please refer to the most relevant graph. The Index has been evaluated by the independent accounting firm Citrin Cooperman & Company, LLP for data integrity and algorithm consistency.